Crest Audio is proud to announce the new CPS series of powered loudspeakers. The CPS line is comprised of three compact full-range speakers and two subwoofers. The CPS10, CPS12 and CPS15 loudspeakers feature two-way designs driven by 1,200W Class-D Crest Audio power amplifier sections. The CPS15 Sub and CPS18 Sub subwoofers feature 2,000W Class-D Crest Audio power amps. The CPS Series powered speakers are designed to be lightweight and versatile for use in a number of applications including bars, music venues and outdoor spaces. Each is constructed of strong, lightweight birch plywood and finished with a durable and attractive black polyurethane coating. Each of the satellite loudspeakers include nine flying points and a standard pole socket for easy mounting in permanent installations or in portable PA rigs. Each of the subwoofers include a top-mounted threaded plate into which poles can be mounted for suspending the satellites. 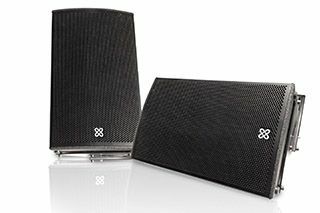 Each of the full-range speakers (10”, 12”, or 15”) share a one-inch driver in a rotatable horn and symmetrical design suitable for use as a monitor or in standard applications. Each model also features a 40-bit, 96kHz DSP circuit with four presets: standard, indoor, monitor, and low cut, the latter of which allows the enclosure to 'match' to one of the CPS subwoofers. The 15” and 18” subwoofers are equipped with analog processing, and thanks to a stereo input (which provides a total of two inputs and two outputs) no external processing is needed when matching a sub to a satellite. Additionally, there is a selectable crossover switch (80 or 125 Hz), a switch for the selection of the zero- or 180-degree phase, and a volume potentiometer. The CPS Series loudspeakers provide impressive output for such an efficient package. The CPS15 satellite can reach 131dB and the CPS18 Sub will peak at 134dB. The CPS range utilizes Crest Audio’s highly efficient Class-D amplification mounted to a large aluminum plate, which strengthens the rear of each respective cabinet and acts as a heat sink for the power amplifier. This arrangement eliminates the need for fans, making the units suitable for applications such as places of worship. The new CPS Series of powered loudspeakers will be demonstrated on the Peavey Commercial Audio stand (#C10129) at the InfoComm 2014 exhibition in Las Vegas, June 18-20, 2014.